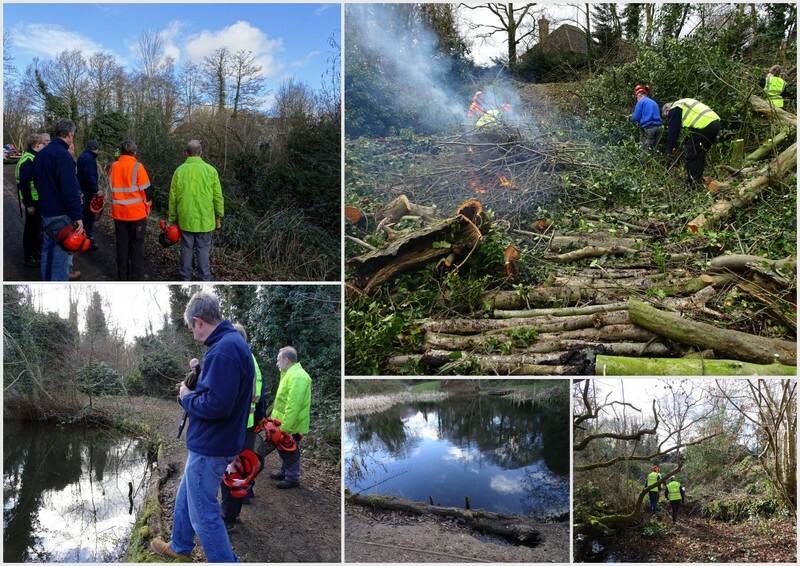 This week (7/8th March) we were working along the Marriott’s Way – the route of the old railway line between Norwich and Reepham – clearing an Alder copse alongside the embankment near Pendlesham Drive where the road between the two areas of Thorpe Marriott crosses the path. Contractors had previously felled a number of large Alders and we were working on behalf of Broadland District Council to clear the area. When we arrived on Thursday morning Matt was already at work cutting the felled trees into smaller chunks. So, while Matt worked away with his chainsaw Paula walked us around the site and briefed us on the jobs lined up for the next few days. 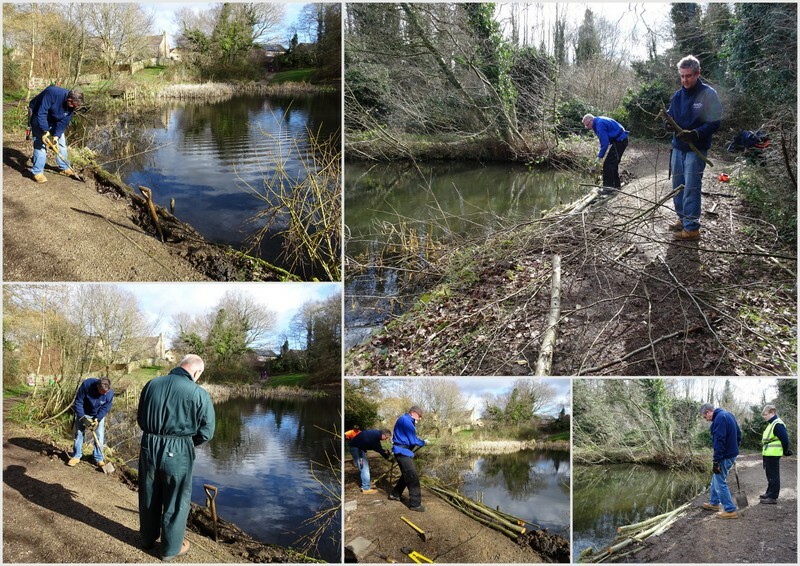 In addition to clearing the trees some work was required on the edge of the nearby Suter Drive Pond to shore up the bank adjacent to the footpath. The felled trees were lying in tangled mass in a deep hollow beside the path. Trees on top of trees with barely any room between them. The task was to sort it all out and burn as much of the wood as possible. As well as the trees there was a lot of holly and ivy in the area which had also been cut. 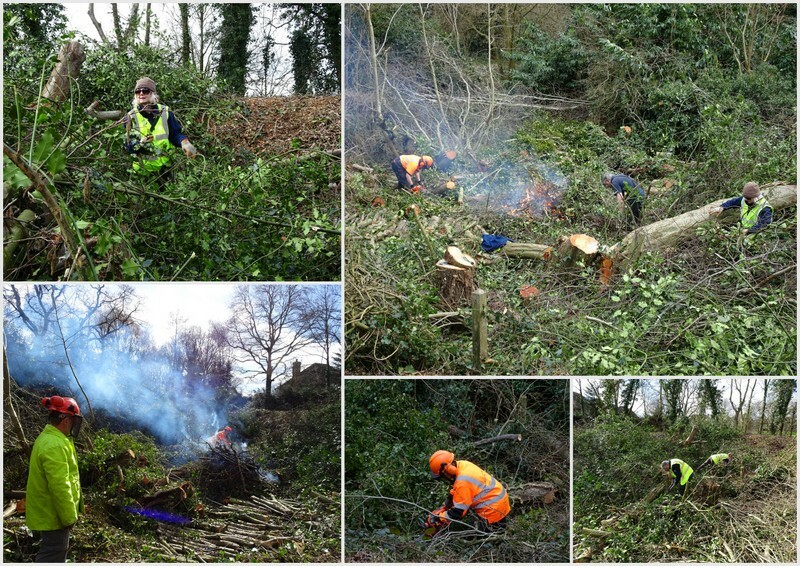 A fire site was identified but was covered in branches and trunks, so the first job was to clear some of this away to create an open space for the fire. However, the bottom of the site was wet with muddy pools in places. 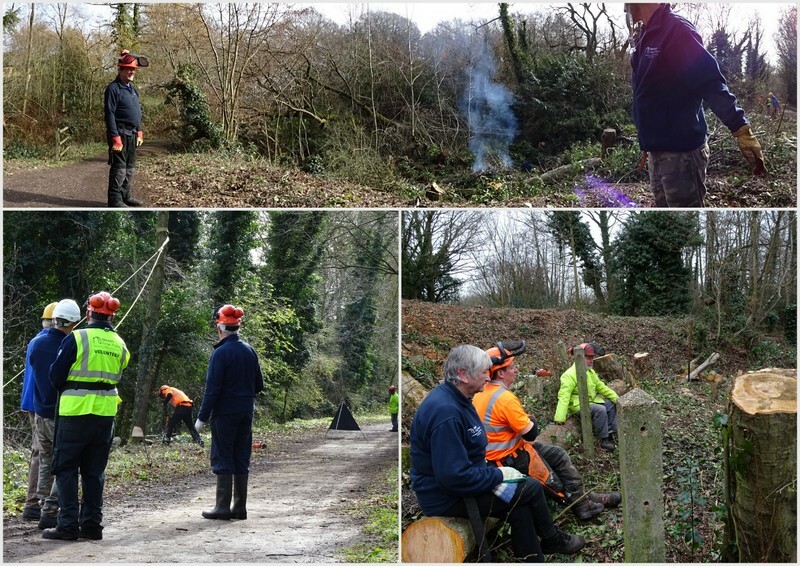 We quickly realised that it would be difficult to work without getting stuck, so laid trimmed branches to create a corduroy path to the fire site. A corduroy path is made from similar sized lengths of timber laid down next to each other creating a stable surface on which to stand. It is an ancient technique for making paths across boggy or marshy ground and is very effective. A Corduroy path is named as such because of the finished effect looks a lot like the ridged fabric of Corduroy material. (In the early 1970s I used to wear a pair of orange Corduroy V-Kneed flares which were then the height of fashion – I wonder what happened to them?). We built our fire site on a pile of raised logs to keep this clear of the wet ground and cleared the area around this to give us some working space. Preparations completed we lit our fire and, once we had this going, worked our way through the piles of branches and brash. Working in the bowl-shaped area meant that the smoke whirled around and because of the tight space between the trees and the wet ground it was difficult to move quickly enough to escape this. Keith, Dave and Ian tackled the pond digging soil out from the edge where this had eroded and laying trimmed branches in the hole and securing these in place with stakes and wire. This was then back-filled with soil. Job done they returned to Marriott’s Way to cut down some of the smaller trees along the top edge of the embankment. Matt had since returned to the office so Paula carried on reducing the size of the felled timber to make it easier to burn. There was just so much of it and it seemed as if we were making little progress. By finish time we had made an impact on clearing the site but still had plenty left to do. We re-grouped on Friday, got the fire going and carried on burning. Matt was with us and we all helped him to fell a large tree on the edge of the embankment. We pulled on the rope and watched out for walkers and cyclists while Matt cut down the tree. The greater problem was still the tangle of tree trunks in the hollow which were lying on each other and therefore under tension. We spent a bit of time working out what to cut and where so as to minimise risk of the trunks rolling or springing upright as the weight on them shifted. A bit of careful planning and lots of experience proved invaluable in working through the problem and cutting up the trunks without any mishaps. The old lineside fence ran through the hollow with much of the wire still attached but covered with brash from the felled trees. It was a hazard when using the chainsaw, so the wire was cut and removed from the posts. Each of the posts had been stamped with a group of numbers which looked very much like the date of manufacture in which case all in this section dated from 1921 – a few years before any of our volunteers were born. 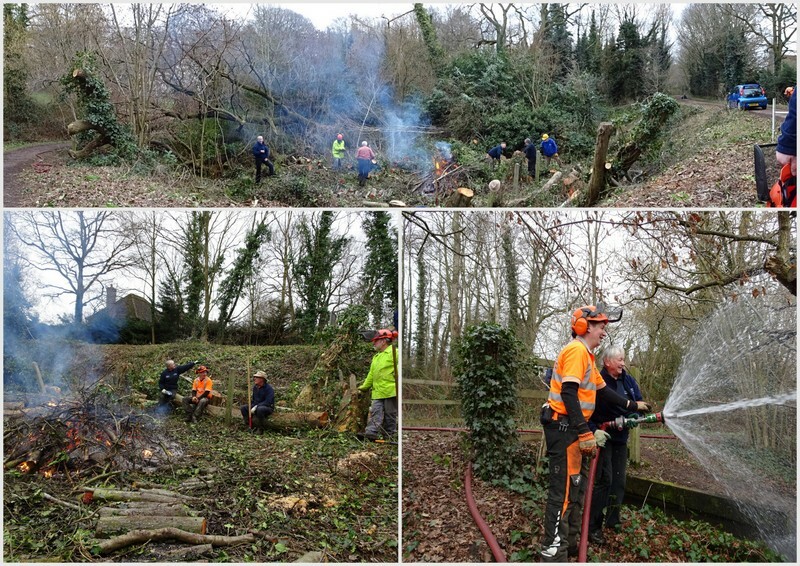 By close of play we had cleared much of the felled timber and largely cleared the hollow. It looked a whole lot different from when we started out on Thursday morning but there remains some further clearance work to do at some stage. Before we left, we got the pump going and Liz doused the fire with water from the nearby pond until this was completely extinguished. As we stood on the embankment surveying our work a Robin flew into the hollow followed shortly by a second. Perhaps they were inspecting our work and checking if we had done the job properly. More likely they had come to see what they could find after we had disturbed the soil and churned up a lot of interesting tasty bits. The Robins are usually the first birds to visit our work areas and often join us and explore while we are working as we have reported in our other blogs. Homemade cakes on Thursday were a tangy lemon and lime drizzle from Paula and flapjacks from me. I still had some flapjacks left for Friday when Liz also brought along some flapjacks. Liz had flavoured hers with Sloe Gin and used lots of fruit and seeds to make them really scrummy cakes. Mine were flavoured with Sloe Whisky, an alternative to the usual Gin base and also very drinkable and tasty. The decanted Whisky soaked Sloes have since been used to flavour some left-over medium sherry much improving the taste of this! The team had to try both flavours of flapjacks again and again but couldn’t decide between the two offerings. You will find our flapjack recipe on our Tailgate Tucker page and can adapt this to include your preferred ingredients to suit your taste and use what you have available.